CESAR® Entrées With Beef Food For Small Dogs is formulated to meet the nutritional levels established by the AAFCO Dog Food Nutrient Profiles for maintenance. 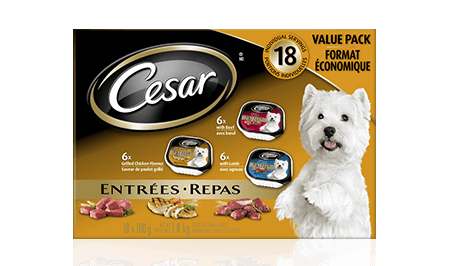 CESAR® Entrées Grilled Chicken Flavour Food For Small Dogs is formulated to meet the nutritional levels established by the AAFCO Dog Food Nutrient Profiles for maintenance. CESAR® Entrées With Lamb Food For Small Dogs is formulated to meet the nutritional levels established by the AAFCO Dog Food Nutrient Profiles for maintenance. Beef:MEAT BY-PRODUCTS, LIVER, BEEF, CHICKEN, CHICKEN BY-PRODUCTS, MINERALS AND VITAMINS, GUMS, COLOUR, DRIED YAM, NATURAL FLAVOURS, SODIUM NITRITE (FOR COLOUR RETENTION), WATER SUFFICIENT FOR PROCESSING.Grilled Chicken:MEAT BY-PRODUCTS, LIVER, CHICKEN, CHICKEN BY-PRODUCTS, MINERALS AND VITAMINS, GUMS, COLOURS, DRIED YAM, NATURAL FLAVOURS, GRILLED CHICKEN FLAVOUR, SODIUM NITRITE (FOR COLOUR RETENTION), WATER SUFFICIENT FOR PROCESSING.Lamb:MEAT BY-PRODUCTS, LIVER, LAMB, CHICKEN, CHICKEN BY-PRODUCTS, MINERALS AND VITAMINS, GUMS, COLOUR, DRIED YAM, NATURAL FLAVOURS, SODIUM NITRITE (FOR COLOUR RETENTION), WATER SUFFICIENT FOR PROCESSING.